Ezdenia made it to level 60 on Monday. She managed to make it this far, and is getting impatient to get to 85. Then the real fun begins. I say this because so many randoms lately have been hit and miss…mostly miss. Some know what they are doing and where they are going and the ones that don’t, well…they don’t last long. Anyway, I can see why Disc priests are so popular! And I thought she would be too squishy healing. She does ok for herself tho. I have to say tho, that with a good group and a good tank…it can be boring. And as I found out from 57-60, if you have a good Dk tank it can get very boring. But that is good right? Things die faster and dungeons are run faster…which in turn means we level faster. But I did actually find myself wishing for a jumpy hunter or impatient mage to pull something extra into the mix a few times. Something to make it more interesting…and give me something more to do than bubble tank, wait, wait, wait, Penance if he blows through the bubble and is getting near half health…or if not and dps is getting hit for some reason, then I can throw out a Prayer of Healing and be done. I think I like rush of someone accidentally pulling an extra group, just so I could save the day. Which tends to put a smile on my face for a little while. I gave her a break today and got to work on Calizari so she could get back to having some fun too. Although tomorrow evening Ezdenia insists on going with guildies on a Molten Core run. If only she were 70…then she could hitch a ride to the Karazhan run that is going on right before that. Oh well, she will just have to do with what she can get…for now. She managed to get a Smolderweb Egg during one of her many Blackrock Spire runs. She did miss out on the other companion pet that drops in either Upper or Lower Blackrock Spire. That’s ok…maybe Calizari will get a chance or two at it. While Calizari was traveling through Booty Bay…she remembered to stop and buy a couple each of the Senegal and Cockatiel. So now she and Ezdenia have those as well. Which quickly got Ezzy the Plenty of Pets Achievement! Well, at least she is resting a little now…but I bet she is already kicking around the dirt waiting for tomorrow nights run…let’s just hope there are enough that signed up for it that she gets to go. Otherwise she will have to wait to see what else she can find to do. If you haven’t been over on The Blue Haired Geek…go check her out! Week 3: Trio Dings 40! Trivenna is finally getting some of the Plate gear she needs. It has been pretty easy just managing Holy Power with the few healing spells she has now. She definitely can take more of a beating when tanks can’t hold aggro. It’s kind of boring healing 5 mans, unless things get crazy, but that doesn’t always end well either. Ezdenia got her ‘Wings’ and is playing around with those a little bit. Doing Dps just feels weird somehow too. I have already had one Tank that had no clue about Smite healing Disc priests and rage quit. I may take a look at the non-atonement spec and be more of a shield spammer. And since I haven’t done any PvP as Disc yet, it may be a good time to check out a PvP spec and give that a go soon anyway. Lots to figure out on Ezzy. And Calizari is having a blast! She finally got rid of those starter area Bracers and has gotten some better gear. 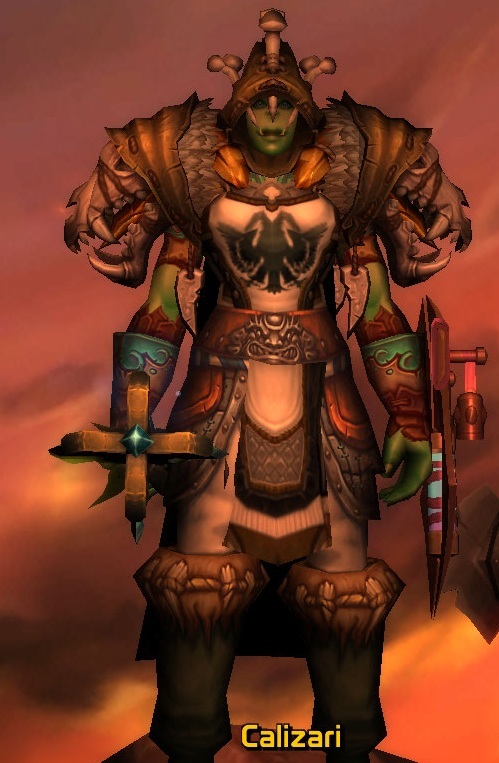 After so many groups that would rather goof off than kill mobs, she needs all the gear she can get to keep her alive. The only piece that has not dropped for her yet is a Head piece. Maybe tomorrow. So they should all be happy toons and get a little bit of rested time built up. Ezzy….umm Ezdenia looks so cute when she pops her wings! I need to do some reading on Disc Priests. I will start with some reading on MMO Champion and then see what there is on YouTube to watch on Disc Priests and then of course there are a few Blogs to check out as well that may help me find what I am looking for.